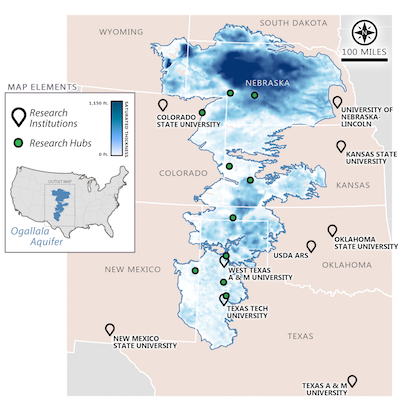 The Ogallala Water Coordinated Agriculture Project (OWCAP) is a USDA-​NIFA funded (2016-​2020), multidisciplinary research and outreach project focused on helping to address issues related to groundwater declines (quantity & quality) and long-​term agricultural sustainability in the High Plains region. Our team of ~70 university researchers, Extension specialists, students and post-​docs is based at 9 institutions and 6 hub agricultural experiment stations in 6 Ogallala states. Develop and improve understanding of successful field-​based management across the spectrum of dryland to fully irrigated production. Investigate socioeconomic factors affecting water use decision making and identify incentives and policies effective at increasing efficient water use while maintaining productivity and profitability. Encourage the adoption of tools and strategies effective at improving water use efficiency, water conservation, and farm operation profitability. Sign-​up for our newsletter is simple: enter your email address in the field located in the upper left hand corner of this website. Self-​imposing water limits in CO?